Whether reviewing contracts, sending out bills, or marketing the latest products, corporations around the globe have come to rely on their email systems as much, if not more than, their core financial reporting systems. In short, email has become the life blood of the corporation's ability to communicate with the world. To support the corporation's mission IT organizations must ensure that their email systems are available and performing regardless of the underlying problems that arise including system or component failures. 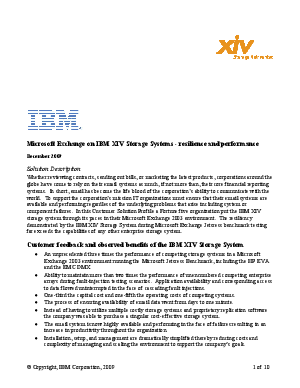 In this Customer Solution Profile a Fortune five organization put the IBM XIV storage system through its paces in their Microsoft Exchange 2003 environment. The resiliency demonstrated by the IBM XIV Storage System during Microsoft Exchange Jetsress benchmark testing far exceeds the capabilities of any other enterprise storage system.